When people begin discussing the various types of IRAs, they often get bogged down in the details of a 401K or a Roth IRA and similar variations. While there are certainly differences between for example, a traditional IRA and a rollover IRA, that isn't necessarily the focus when you explore the value of a Self-Directed IRA. Today, many people meet with their financial advisors and make choices from a selection of available investments. While they believe they are in charge and making the decision of how best to manage their IRA, they are generally making trades based on a preset menu of allowable investments. With a Self-Directed IRA, the menu gets a lot bigger and you are in control to direct the investments, including investments offshore. This means you can widen your financial and investment options and take more control over your future. A SDIRA contains more choices than simply traditional stocks and bonds. It includes less common investments, some of which offer significant potential for investors. You can even use other plans that are designed for small business, or individuals, such as Simples, or SEPs. Advanced Self-Directed IRA strategies give you tremendous control and flexibility over how you invest your hard-earned money. These different types of retirement savings plans are called Qualified Retirement Programs, most of which have a custodian who is acting on your behalf. But there are advanced strategies where you can control the assets and, in some cases, even be the custodian. Unless they are active plans being sponsored by an employer and contributed to by the owner, they can be "rolled over" to fund a Self-Directed IRA strategy. Those interested in Self-Directed IRAs are generally seeking higher returns or more diversification of their assets than are available with other types of IRAs. If you're interested in the idea of a Self-Directed IRA, then it is also important to understand what it involves. It doesn't mean that an individual can cash out their traditional IRA and start buying or investing in just anything. There are roles for a custodian and an administrator, and both are critical. Traditionally, an IRA custodian is a large financial entity. If you work for a major corporation in America and have a 401k through them, then your custodian might be a major player like Schwab or Fidelity Investments. A custodian holds your Self-Directed IRA assets on your behalf and verifies that the assets held in your IRA are yours through reporting those holdings to the IRS. The IRS has strict requirements for custodians and are subject to audits and inspections by regulators. There are things that you can hold and there are things that you can’t hold in an IRA; a custodian is responsible for ensuring that you are not investing in something that you cannot hold. An administrator, on the other hand, is the company that helps you establish a Self-Directed IRA. In many cases, they serve as a middle-man between the investor and the custodian. Administrators keep records and generate necessary statements and documents. As an individual, it is critical that you find an administrator that you can communicate with well and who understands your investment goals. There are also situations where the individual can actually be a custodian, such as a SOLO 401K. This is an advanced strategy where the individual owner is both the IRA custodian and the IRA owner. In that situation, the individual is responsible for not only managing the assets but reporting them to the IRS. I would not recommend this to anyone who is not "accounting-minded" as you need to account for all funds, comply to all regulations, and prepare reports annually. Imagine that you're hungry and you go to a restaurant for a meal. You speak to the chef and are told that you can enjoy anything from a limited menu of four items. Although the options might be tasty, many people want to know what else is out there. Think of the limited menu as a traditional IRA made up of stocks and bonds and orchestrated by a giant firm serving as the custodian. Now, think of a Self-Directed IRA as the full menu with dozens of available entrees, appetizers, and desserts. There are, of course, some rules for what a Self-Directed IRA can contain. Having an IRA means considerable tax benefits, so the IRA does regulate what can and can't be included within the account. 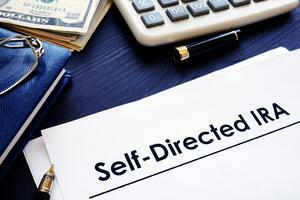 However, a Self-Directed IRA means more options, especially for a savvy investor. Your Self-Directed IRA can contain anything from precious metals to real estate. That means you can make more informed decisions and choose the investments that make the most sense for your future, your lifestyle, and your goals. Clearly, there are many benefits to Self-Directed IRA investing. If you want to be in the driver’s seat to explore and select from any of all the investments allowable by the IRS, a Self-Directed IRA is an obvious choice. Georgetown Trust in Belize has 20 years of experience in helping individuals manage their assets to create the wealth and financial freedom they desire. Contact me or one of our financial experts today to get started with a Self-Directed IRA or other offshore financial service.